The plot of The Goonies may not win any awards for originality, but that doesn’t stop it being a great example of the classic case of the evil business man who will bulldoze the homes of a group of kids and their families in order to build a golf course, or shopping mall or something, unless the parents can come up with an unfeasible amount of money to stop him. I forget exactly what the developer wants to build in this case, but it doesn’t matter as you’ve no doubt seen this plot a thousand times before. The kids, who call themselves the Goonies, find a treasure map supposedly leading to the horde of pirate One Eyed Willy. They decide to follow the map in a last ditch effort to save their homes. 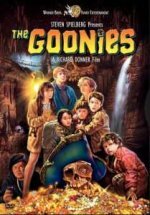 Where The Goonies excels in telling this story is the wide variety of the misfit characters who work together to save their homes, the convincing back story, and the second set of evil comedy villains, the Fratellis, who follow the Goonies trying to claim the treasure for themselves. Everything gels together perfectly, as you would expect from a film that had Steven Spielberg, Richard Donner and Chris Columbus (no, not the explorer) behind it. I distinctly remember Um Bongo being launched whilst I was still at primary school, as everybody would sing the TV advert jingle at the drop of a hat. Um Bongo the drink is a tasty tropical fruit blend containing 9 different types of fruit, and you can still buy it today. 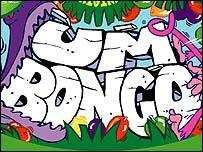 I must admit with the politically correct attitudes of today I’m surprised someone hasn’t found the name Um Bongo to be offensive and have it banned. The Rhino said, I know, we’ll call it Um Bongo. 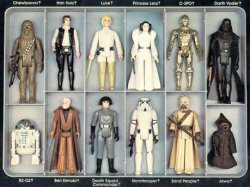 One of the biggest legacies of the original Star Wars trilogy will always be the way it changed the way in which film and TV related merchandising was considered. Obviously toys, books, games, lunchboxes and the like were tied in with films long before Star Wars came along, but the sheer range of merchandise branded with the Star Wars logo eclipsed anything that had come before. Created at the tail end of the 1970’s, but repeated many a time on ITV’s lunchtime kids schedules, Chorlton and the Wheelies was a stop motion animated series with a catchy theme song that was all about the exploits of Chorlton the Happiness Dragon, and his friends the Wheelies from the imaginatively named “Wheelie World”. 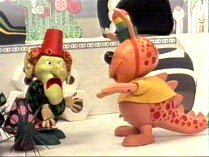 Chorlton was a big orange dragon with a multicoloured hat who lived with the Wheelies as their protector from the nasty Fenella, the Kettle Witch. He was called the Happiness Dragon because he was always able to look on the bright side and see the best in people, even Fenella, who was particularly annoyed by this. Chorlton had a great northern accent, and would generally say “Ay-up lad” at least once in every episode. His other catchphrase was “‘Ello Little Ol’ Lady”, in reference to Fenella, who hated it! Yahoo! It’s Buckaroo! A donkey doesn’t do what it doesn’t want to do. So went one of the TV ads for Buckaroo that I remember being aired as a child. Buckaroo involved a spring loaded plastic donkey that players took turns trying to load up with little plastic items such as a rope, a lantern and a shovel. They had to be placed carefully, as if you were too heavy handed the mule would kick up his back legs, spraying plastic tools every which way. Whoever triggered the bucking bronco would be pointed at by the other players and declared the loser. That’s really all there was to Buckaroo. Digging the game out of your cupboard and setting it up, then collecting all the little plastic items back up again took longer than it did to play, and you were pretty bored of it after two or three games. Setting the donkey up was always an awkward thing to do as well, as it took several attempts to lock it into the down position, and then it was possible to lock it down too well so the blasted thing wouldn’t buck no matter how hard you dropped the plastic guitar on it’s back. Still, it’s a nice idea for a game, and one that’s stood the test of time as it’s still available today, albeit with a more three dimensional donkey these days. In the mid-1980’s, Michael J. Fox was one of the most bankable movie stars, building up a loyal following of fans and a respectable collection of films to his name. Of these, the Back to the Future trilogy is undoubtedly the series for which he will forever be best known. Released, and initially set, in 1985, the story is about an ordinary teenager named Marty McFly (Michael J. Fox), who ends up whisked back in time when he gets caught up in a test of Doctor Emmet Brown’s (Christopher Lloyd) latest invention. The idea for the flux capacitor came to Doc Brown when he fell off the toilet after trying to hang a picture, and it was this invention that made time travel possible. So, the flux capacitor has been hooked up to a DeLorean, which when driven at 88mph will allow the car to travel through time. The test is interrupted by some terrorists (who Doc Brown stole some plutonium from to power the car) and Marty end’s up being the world’s first time traveller whilst trying to escape them. The Space Hopper originally appeared in the early 1970’s, and is still available today. The classic orange design with the big goofy face (apparently it’s meant to be a kangaroo) is instantly recognisable, and it’s the sort of toy that even as an adult, you can’t resist grabbing hold of and having a quick bounce. Consisting of little more than a big orange inflatable rubber ball, with two ridged ear-like handles sticking out of the top, all you could do with it was sit astride it, holding on to the ears, and bounce up and down a bit. It didn’t make you bounce particularly high, and it didn’t allow you to cover distances any quicker, but it was still a lot of fun just bouncing up and down on the spot, giggling like an idiot. Suggs and co., seen here doing their trademark too-close-together walk, are one of those bands whose songs you’ll instantly recognise whenever you here one. They have been variously categorised as a Punk or Ska band, but according to Wikipedia they are neither of these, but instead something called 2 Tone, which is a fusion of the two aforementioned musical styles. So there you are fact fans! Now you know! Anyway, the band formed in 1976, but during the 80’s they had no less than 13 top ten singles, and are the record holder when it comes to most weeks spent in the UK singles chart during that decade – 214 weeks no less! They had a number 1 with House of Fun, whose lyrics went completely over my head as a 9 year old, but didn’t stop me singing along. This was in 1982, which also saw the release of Driving in my Car and Our House, two more of their best known songs. I think one of the reasons I liked their songs as a child must have been that they were about normal things, so you could relate to them as a pre-teenage boy much more easily than most pop songs that generally revolve around the concept of love.